This is quite a short YA novel, a standalone book that I just picked up on impulse. 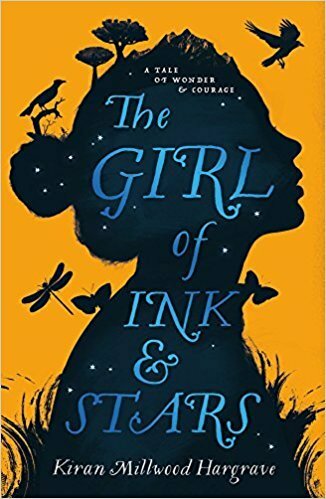 I immediately got the impression that this was aimed at slightly younger teens – the protagonist was only thirteen, so I didn’t really connect that much. It’s that awkward age where you think you’re old, but you’re not. I could imagine thirteen-year-old me would enjoy this quite a bit. Isabella lives alone with her father, a skilled cartographer. Her mother and twin brother had passed away, leaving the two alone. The Governor had taken control of the land, and his daughter, Lupe, attended the same school as Isabella. The two were very close, and Isabella’s angered outburst causes Lupe to run off into the Hidden Territories to prove she wasn’t “rotten”. A classmate of theirs had recently been found dead, and Lupe was going to find the killer. Isabella, disguised as her deceased brother, shows Lupe’s note to her father and a small group begin going after her, Isabella included. They follow a map passed down to Isabella’s mother, through blackened forests scattered with bones. They do find Lupe, along with the Banished and, worst of all, the hell dogs from Isabella’s favourite myth. This myth turns out to play an important role in their journey, and Lupe discovers something about her father when he sacrifices himself to fend off the wolves. They face Yote himself – the mythical fire demon – and Isabella finds herself returning home without Lupe. It is quite a young teen book, as I said, and the plot develops all because of Isabella calling Lupe’s family “rotten”. This drama and exaggeration is pretty typical of a children’s/teen book, I find, and seemed a little immature to me. The writing was great, I just couldn’t get over the simplicity and immaturity of the plot at times. For a teen book, it was quite dark at times – a lot of death was included. The ending was both happy and sad, which is nice. I get quite fed up of too many happy endings. 3 stars.